I call Georges Bourgoigne in the Fort Lauderdale office of Camper & Nichlosons and he asks me to mention that his co-central agency, with Bill Sanderson, the 75m sailing superyacht Mirabella V is now 'aggressively' for sale and offers are highly encouraged. Delivered in 2004 by Vosper Thornycroft, she's proved to be a very popular charter yacht and accommodates up to 16 guests in a master, four doubles and two twins plus two Pullman berths. 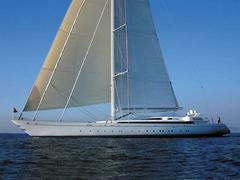 The largest sloop in the world, Mirabella V is currently asking €49 million.